Try an Escape Room this Weekend! Are you craving for an adventure this weekend but, also hoping to avoid the holiday traffic? Are you looking for something new and fun to do with your friends and family? How about trying an escape room this weekend! An “escape room” or “escape game” is a form of entertainment in which a player interacts with a physical space to solve a series of puzzles using clues, hints, and strategy. Generally, you’re playing with a group of 2 to 12 people and working against a 30 to 60 minute time limit to “escape the room”. Escape rooms first originated in Asia and were inspired by “escape-the-room” style games. They’ve now spread over to Russia, Europe, Australia, New Zealand, and South America. As of 2017, there are now over 8,000 escape room venues worldwide and that number is only growing. 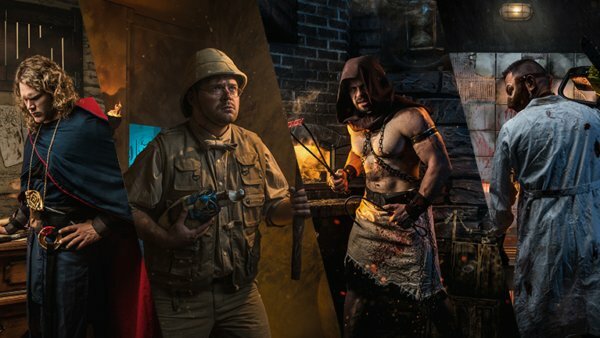 Because the escape room industry is growing and evolving rapidly, many creators are coming up with creative ways to heighten the experience. Many rooms are themed with a rich storyline. Some include detailed set design and theatrical-quality effects. Others include haunted house elements, scavenger hunts, and aspects of interactive theatre. At Quest Room, we believe an escape room experience should accompany all these elements to be immersive. This means that every component you’ll find in our rooms contributes to an overall storyline. This is so that you don’t feel like you’re solving “just puzzles” but, actually living a quest or an adventure. We offer escape rooms for all audiences! Our most recent, Red Giant, is an Egyptian themed room takes you through the legendary Pink Pyramid. It is said that a treasure known as the Red Giant, the most valuable ruby in the world, lies within the great edifice. Other rooms are Cannibal’s Den, Da Vinci’s Challenge, and Bloody Elbow. We’re also holding a special Memorial Day Weekend sale! 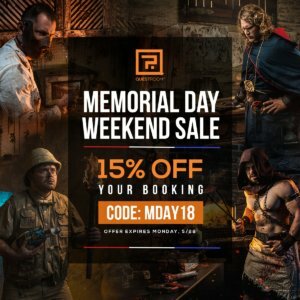 You can get 15% off your booking using code “MDAY18” at check out. Offer valid until Monday, 5/28. Happy escaping! QuestRoom is an immersive escape room and entertainment company based in Los Angeles. We believe in rich storytelling, extreme attention to detail, and high production value and quality. We strive to create not just an escape room but, a fully immersive, multi-sensory experiences. Software by Design by 2019 © WLA Entertainment, Inc.